MY PIANO FAMILIES STAY AROUND. For many years, I’ve been a “siblings specialist”, because I’ve had the pleasure of teaching 2, 3, and 4 students within families. This is a great honor - to be able to be a part of my piano families’ lives for many years. Piano teachers have unique perspectives of their students, because we get to see them each week throughout the school year, over a period of years. Luke, on the left, is now 16, and will drive himself to lessons. Adam, 14, to my left, is just beginning high school, and Jonah, almost 13, was not quite 5 when he began lessons. They all play piano very well and are talented percussionists. Luke and Adam march for Center Grove Bands and play winter percussion. Jonah plays percussion in concert band and two sports, as well. ​Getting to see students develop over a period of time is so fun! "Each of my four children spent 12 years studying piano at Studio J over a span of 20 years. How fortunate and blessed my children are to have been taught by Janelle Bracken! She provided them with a music education of the highest caliber while attending to their unique learning styles. Her ability to coax the reluctant student along or challenge the occasional prodigy are just a couple of the traits that make Janelle such a jewel of a teacher. 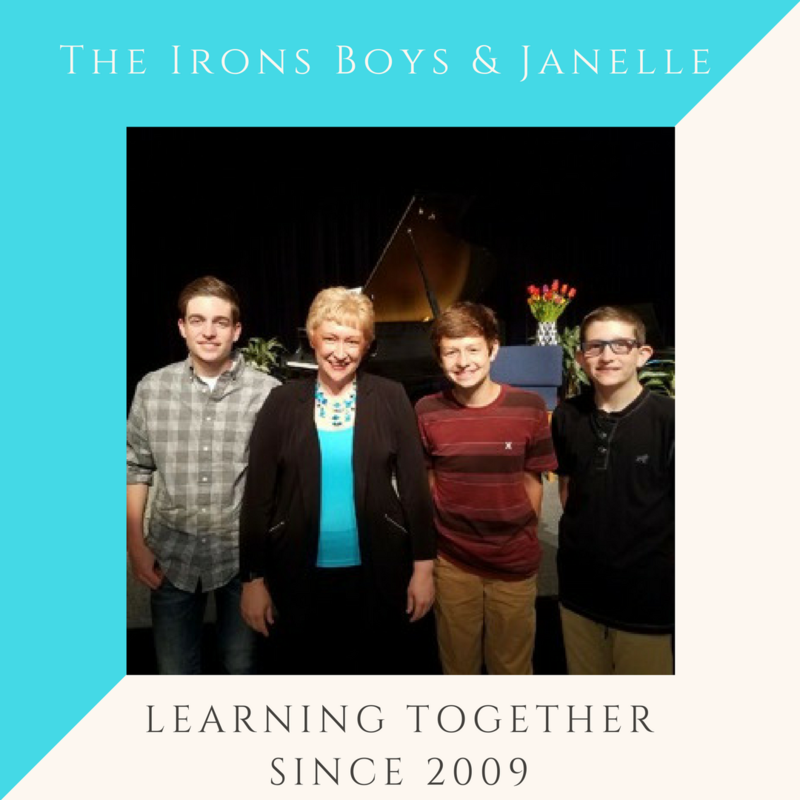 Using computer programs customized for the learning style of each child along with music games, individualized curriculum, piano parties, recitals and competitions, Janelle made the study of piano a fun, challenging and rewarding experience." "I spent two months looking for the correct match for [my little friend]...I knew after speaking with Janelle she was highly qualified in piano instruction. But after observing my little friend's beginning lessons, I knew Janelle is a gifted teacher of young beginning students. As a retired teacher of 40 years, in 1st, 2nd, and 3rd grades, I knew how important the beginning of lessons are. A firm foundation must be built. Janelle always makes the lessons interesting and very interactive. She uses a variety of teaching tools - games, cards, computer activities. No two lessons are ever the same. This is so important when teaching young children, because they need a variety of activities. And most important is when a child has difficulty with a concept, Janelle has several reteaching ideas to try in her "bag of tricks".